Tucker Hibbert’s limited edition 8-peat t-shirt is now available for pre-order! Only 368 of these limited shirts will be printed. Tucker will personally number and autograph each shirt. 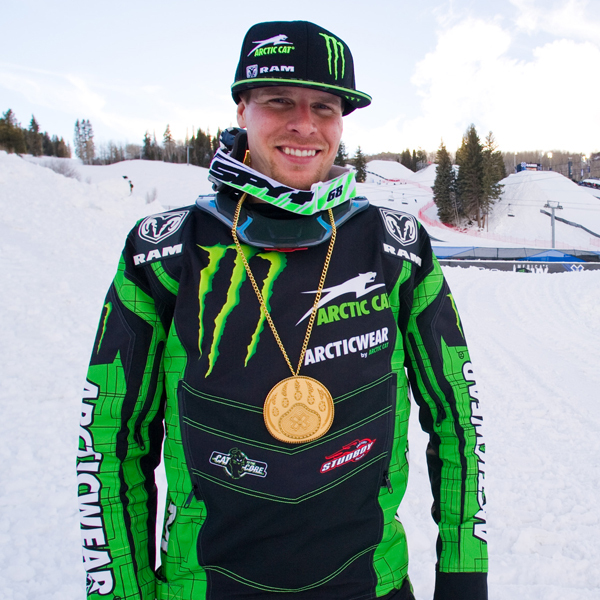 Monster Energy / Arctic Cat / Ram Truck’s Tucker Hibbert put on a dominating performance at X Games Aspen 2015 to win a record eighth-consecutive Snocross gold medal. Now with 13 overall medals, he’s tied for first on X Games’ list for the most medals in a single winter discipline. Tucker Hibbert helps fulfill Nick’s wish to own a snowmobile! 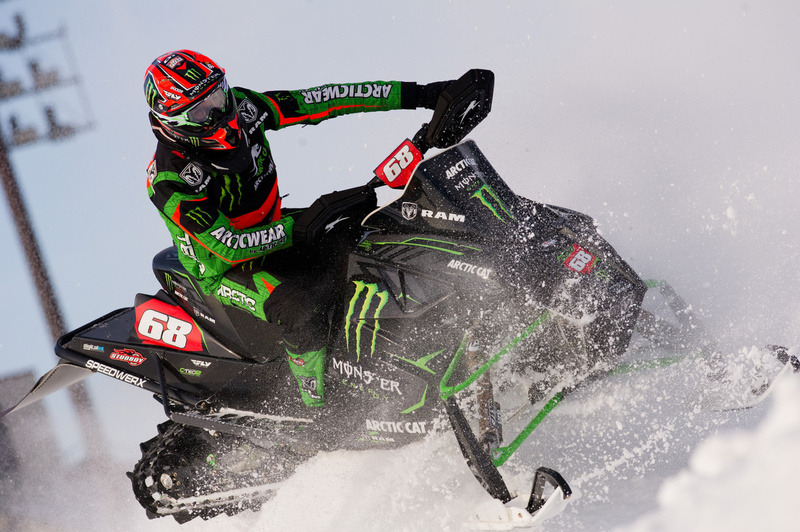 With the support of Arctic Cat and Make-A-Wish Minnesota, Tucker Hibbert helped fulfill Nick’s wish to own a snowmobile. 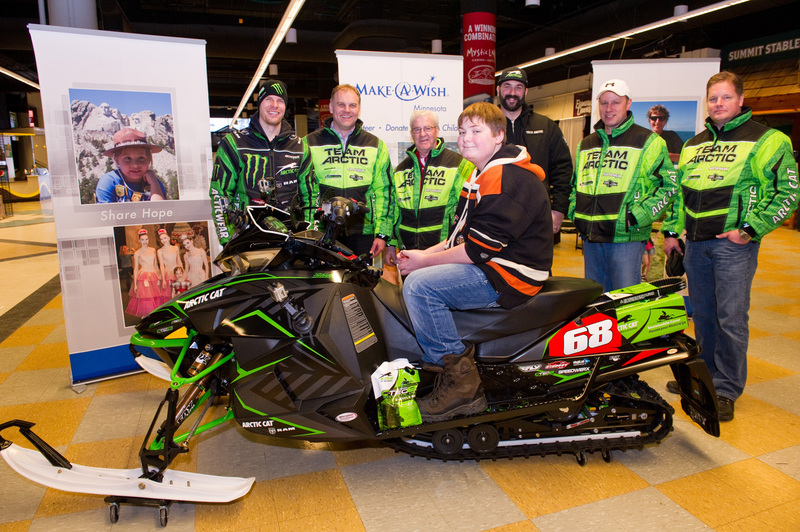 On January 8, the 14-year-old who’s battling leukemia, was surprised with the keys to a 2015 ZR 6000 Tucker Hibbert Race Replica snowmobile! Recently cleared by his doctor to return to physical activities, Nick didn’t waste anytime breaking in his new sled. With a national snocross track groomed and ready to ride at Canterbury Park in Shakopee, Minn., Tucker helped Nick gear-up and hit the track with him! Below is a link to the story posted on Make-A-Wish Minnesota’s website along with a video recap of Nick’s special day. For more information on Make-A-Wish and how you can help fulfill a wish, visit http://wish.org. Despite falling short of reaching the top spot of the podium, Monster Energy / Arctic Cat / Ram Truck’s Tucker Hibbert extended his points lead at the ISOC Canterbury Park Snocross National in Shakopee, Minn. Hibbert gained three points over second place, giving him a 40-point lead in the Pro Open Championship chase. Entering the Canterbury Park National, Hibbert had his sight set on capturing his 100th career Pro National victory. He was fastest man on the track both Friday and Saturday but poor starts in the finals eluded him of the milestone win. As the top qualifier Friday night, Hibbert had the first start line pick for the 15-rider, 15-lap final event. He had a solid jump off the line but got pinched in the first corner and shuffled back to eighth place. On a mission to get to the front, he pushed through the pack. On lap nine, he moved into second with leader, Ross Martin, in sight. Closing in on Martin, a bobble on the landing of a jump ejected Hibbert from his sled and left him on the ground. He reentered the race in sixth place and put on a late charge to finish fourth. Hibbert was the top qualifier for Saturday’s final but once again got a poor start. Rounding lap one in 10th place, he struggled to make passes on the smooth, fast track. Once lines started to develop mid-way through the 15-lap final, he quickly began to make moves. With three laps to go, he passed Tim Tremblay to take over third place and put on a last ditch effort to get his 100th career win. In the final two laps, he chased down and passed Martin but came up short of catching holeshot winner and race leader Kyle Pallin. The ISOC National Snocross tour now takes a three-week break but there’s no slowing down for Hibbert. He’ll spend the next two weeks in Colorado preparing for X Games Aspen where he’ll compete for his eighth consecutive gold medal and 13th overall medal. The event will be broadcast live on ESPN Sunday, January 25.